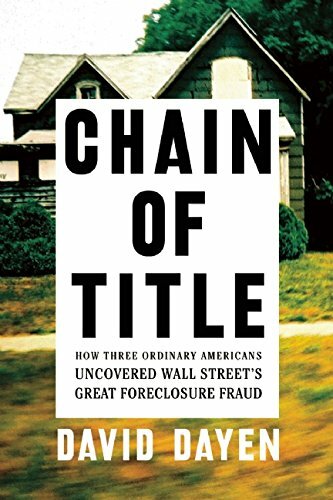 "Chain of Title: How Three Ordinary Americans Uncovered Wall Street's Great Foreclosure Fraud" reveals the story of the enormous foreclosure fraud that caused millions of families to lose their homes based on false evidence by mortgage companies. The lenders had no legal right to foreclose—they messed up the chain of title to the properties by failing to adequately review and sign the documents. The ensuing scandal implicated dozens of major executives on Wall Street. Floridians Lisa Epstein, Michael Redman, and Lynn Szymoniak—a cancer nurse, a car dealership worker and an insurance fraud specialist—were all victims of the foreclosure crisis. While struggling with their shame and isolation they (yes!) actually read their mortgage documents, discovered the deceit behind them and built a movement to expose the flimsy proof that major mortgage bankers were using to take people's homes. Fiscal Times columnist David Dayen recounts a classic David and Goliath story of how these individuals challenged the most powerful institutions in America and exposed a massive corruption by top financial firms.